Remember this post? My swap with Judy from BeautyJudy was a blast and I got around swatching a few of the beauties she sent me. There were some colors that I'd probably passed if I'd buy them myself but after swatching them I loved every single one :o. 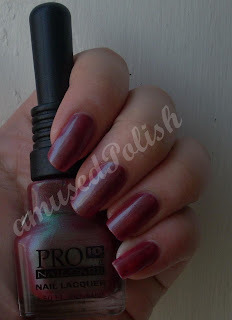 You know- the "Strage Beautiful"-kinda polishes. 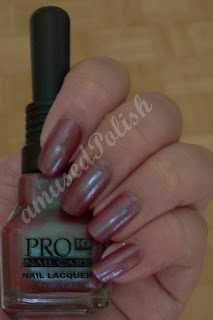 Pro 10 in Changeling: 2 coats of awesomeness. It is a beautiful red (a copper red) with green shimmer. In some angles it even looks brownish. A middle toned brown with a light green shimmer. 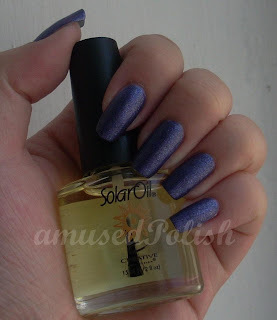 I really like that the bottle cap matches the varnish ^^. Two coats for this awesome sauce. Violet Velour from the Ulta Matte-rial Girl Mini Set. A nice purple matte with silver shimmer?/glitter?. It reminds me of the finish of the Suede-collection by Opi. I couldn't wear this alone so I decided to layer it with Sally Hansen Laser. Zoya Mimi, the beginning of a love story?